It is amusing to read Orwell’s prediction that the USSR “retains enough of the original ideas of the Revolution to make it a more hopeful phenomenon than Nazi Germany.” How wrong he was on that score. Any time power is centralized in a government — be it economic or political power — individual freedom diminishes. Fantastic post, what a prescient piece of writing from the great Orwell. Absolutely necessary reading for everyone today more than ever. You’ve completely, I presume deliberately, missed his point. Did you ignore all the times he deplored Stalin? “the lesser of two evils” he completely made clear, and I’m not sure why you’re using his own opinion that centralised government diminshes individual power as if it was your original thought – that was the whole warning of this piece! Boy he was definitely way off the mark on his prediction re: the USSR. I suppose at the time none on the Allies side liked to think their ally USSR would be capable of such atrocities. Aesop, Hannoch, all he said was that he WOULD support the USSR vs. Nazi Germany. He said this in order to support his position that he would always accept the lesser of the two evils. He says, simply, that the USSR represents a “more HOPEFUL phenomenon”. Aesop, Hannoch, I think you are both wrong: Orwell did not predict that the USSR was going to be successful; just that it had more hope of success than Nazi Germany. On this point Orwell was exactly right. What is it exactly that he was wrong about, again? He only suggests loss of freedom as a grave danger, but not an inevitable consequence. Everywhere the world movement seems to be in the direction of centralised economies which can be made to ‘work’ in an economic sense but which are not democratically organised and which tend to establish a caste system. Hitler disappears, at what cost? More and more people agree with the rise of Capitalism, from Capitalism – The end justifies the means: Anglo-Americans (in a position of power, they established the United States after taking the land from the Native Americans) build a nation based on Meritocracy and the “American Dream”. Economic movements that work “in an economic sense” but establish a caste system: Look at contemporary U.S. society, 80% of the wealth in America is held by 1% of the population. The infallible fuhrer in this case? American ideology of meritocracy and hard work, and getting out of the system what you put in (everyone has equal opportunity in the United States). “the horrors of emotional nationalism and a tendency to disbelieve in the existence of objective truth because all the facts have to fit in with the words and prophecies of some infallible fuhrer.” By perpetuating and actively spreading the gospel of the American Dream, dominant groups in America (WASPs) can essentially control which groups succeed and which do not, do you think it is mere coincidence that White Male Privilege is a large factor in wealth/income? Public policy is shaped by those in power to give resources and opportunity to those seen fit. “But if the sort of world that I am afraid of arrives, a world of two or three great superstates which are unable to conquer one another, two and two could become five if the fuhrer wished it. That, so far as I can see, is the direction in which we are actually moving” The police state of America and the revelations made by Edward Snowden in that the NSA is literally recording and spying on practically everyone in the world? George Orwell is beyond his years in recognizing that which millions cannot see even tens of years later. The Americans talk about meritocracy, but they do not and have not ever practised it economically. In Capitalism, economic might makes right. He was wrong on many levels, but no one can predict the future. He was not the only one to think of De Gaulle as a “furher”. De Gaulle was authoritarian and paternalistic but he was far from a dictator. He resigneds when the voters opposed him, instead of forcing his way on them. And what is that, putting Gandhi and De Valeta in the same bag as Hitler, Stalin, Salazar ? “No fascist movement in Great Britain” ? What about Oswald Mosley ?? Ifind so much or Orwell’s work so spookily prescient, I daydreamingly wonder if there’s such a thing as time travel after all, and if Orwell didn’t set out to somehow warn us. De Valera, for good or ill, was democratically elected on multiple occasions – so more like Mackenzie King than Stalin. That Orwell would lump Dev in with mass murderers says a lot about his blind spots which don’t get a big airing these days. Maybe Orwell really was prescient. How else could he have included the answers to all of ierizat’s questions in the very same letter that caused him to ask them 80 years later? De Valera was no fuhrer. He as opposed and ridiculed by a sizeable minority in Ireland throughout his career. The people who defeated his side in the Civil War handed power over to him, and he in turn did not take retribution on them in any drastic way. His economic polices were a disaster but that is an entirely separate issue. Like so many Englishmen of his time, Orwell was clueless about Ireland. yeah but he did preach a form of isolationism and nationalism as well as creating what was essentially a church state which indoctrinated at least two generations of irish people and perpetrated unbelievable oppression of people. no i wouldnt call him a dictator but he certainly fails under the heading of blindly nationalist and certain things he did were in line with other extreme rulers. So, we wouldn’t have learned much, if we made out of Orwell a leader would we? Absolutely no doubt George Orwell gauged his time and the near future, the protagonists with rise and downfall, as well as hopes and fears exceptionally well. Please permit me to remark, as I am detached from that very moment in 1944, biased through current knowledge -even if intersubjectively proven-, and affected by a soll/ist clarification, I am unable to fully fathom his vision. Similarly -yet/and- without rejection of any criticism, I find it a bit preposterous to re-interpret Orwell’s letter as predictive of FR, GB, USA and RUS success. In the spirit of the time, as the war got longer and longer, the enthusiasm of central forces waned, hopes in the alliance forces increased, and the winner takes it all. I strongly advocate we see the boundariless facts and trends he identified: DE, GB, FR, USA and RUS — all were conducting human experiments (eg. nuclear, twins, euthanasia); all are increasingly gathering data on all aspects of life (big brother); all strive to tighten reach and grip then abuse power at the pinnacle of their reign; wealth indeed is grouped more and more in top 1% casts; the true nature of memories is that of re-drawing and history accordingly re-written. To realise and warn us for these trends, for us to learn how to read and to prevent the production of new such facts; to me this is Orwell’s greatest contribution. It seems the Creator might well have raised up yet another trumpet-of-warning-carrying watchman, as is now being Trumpeted by Jonathan Cahn. Type that in YouTube and see how, also, his music is as correct and inevitable as has befallen every single nation in the history of the world. The Creator expelled man from the garden to learn his lesson the way he insists – the hard way. Mattithyahu 3 indeed. It’s nor dependant upon one person believing. It’s dependant on us all not. Orwell was no economist, which is why he was entirely incorrect on ‘centralised economies can be made to work’. The only debate in economics about centralised economies is the prevailing reasons as to how they fail. They were already predicted to fail by this point in history, but I assume he hadn’t read Hayek. He was also epistemologically incorrect about centralising economies not destroying freedom. You cannot centralise economies without destroying freedom, and you cannot centralise economies without centralising power exponentially. Orwell was a great critic of the Soviets, and a great critic of the cult of personality that consumes people and their liberties with ferocity – but he’s not turning his criticism on his own cognitive biases. Orwell was no classical liberal, he was a statist who romanticised about a powerful state that somehow has no corruption, and no infringement on individual liberty. Yeah, It’s always interesting to see how people try to impute to others their own ideas. 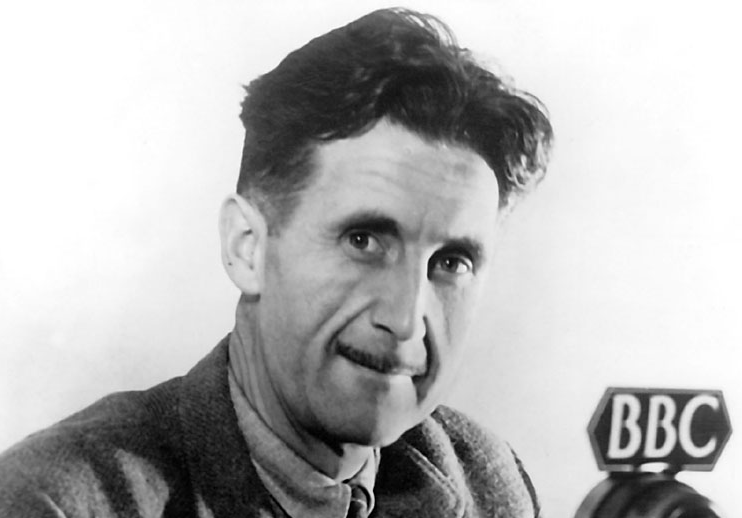 Orwell nowadays seems to be depicted as a libertarian anti-communist hero, notwithstanding his own stated and well-known political stances. Actually he was right, compared to Nazi Germany. It’s just that Nazis lost. How ironic that the advert under this interesting article is an ad for tracking employee attendance. Actually, Orwell reviewed The Road to Serfdom for a British weekly. Unfortunately it’s not as interesting a review as one would hope. The chapter in Hayek on “The End of Truth” (chp. 11?) reads to me so much like a blueprint for the society of 1984 that I am continually surprised to have never seen Hayek mentioned as an influence on the novel. Maybe it’s just that no one is interested in reading both Orwell and Hayek. It’s too bad; both men shared an admirable fear of the slide into totalitarianism and wrote persuasively about the danger, they just saw it happening different ways. Are we forgetting that the book was originally title !948, and changed to to 1984 by American publishers. It wasn’t a futuristic tome, it was about the world in 1948. I have published a book titled LIVING IN 1984–AMERICA’S FLIRTATION WITH FASCISM. For reasons that need no explanation, I recommend reading this to one and all. The richest middle class in history – living at the highest level of material consumption relative to the past and relative to other countries – can increase its share of the wealth immensely by saving. If you are posting on the internet and don’t consider yourself rich, your horizons are as limited as those inside a dumpster. The richest large middle class in history – living at the highest level of material consumption ever achieved anywhere – can increase its share of the wealth immensely by consuming a little less and saving a little more. If you are posting on the internet and don’t consider yourself rich, your self-inflicted horizons are as limited as those inside a dumpster. Any time you have two or more people gathered together, individual freedom diminishes. Better go live in a cave. Oh my goodness are you ever confused. 1. You don’t judge someone’s wealth by how much consuming they do. By definition if they’re spending that money they no longer own it as an asset, and buying consumer goods guarantees that your property will depreciate in value. The only good for which this is normally not true is real estate and even that can drop in value if the market downturns. Wealth is about what you keep, as YOU point out. So don’t jump all over the map and redefine wealth every other sentence. 2. Our middle class isn’t large anymore. In fact, it’s shrinking. The hoarding of wealth by the top 1% is a big part of the reason why. We as a nation are more productive than we have ever been and, rather than prove the theory that hard work and productivity equal higher pay, the boss-men are hoarding that increased productivity and paying off shareholders and CEOs. Not only is this a recipe for societal collapse, it’s not good moral behavior either. If you don’t want to pay your workers, do the work yourself. What’s particularly inexcusable is that so many workers have been replaced by machines now and you can’t pay machines. You might as well let your workers benefit from that increased revenue. 3. If you amass wealth “by consuming a little less and saving a little more” then by definition if you’re paying for internet service you are not in fact rich, or at least not richer than you would have been without said internet service. Unless your employment is through the internet, but of course no one making your sorts of arguments ever considers that. 4. You also fail to understand that just because someone’s on the internet at any given time doesn’t mean they’re paying full cost to access the internet. What about people using library computers and going online? What about people living in a multi-adult household and everyone pays a little into the internet bill? What about a person with a secondhand laptop going to public places with wifi? I’ve even heard of homeless people with laptops because they didn’t have enough to pay for a place to live but they had enough to get the computer. You can find laptops now that cost way less than rent–or, if you rented a place for that little, you wouldn’t want to live there. And $500 isn’t wealth unless you’re in rural Africa. More perspective and less judging please. UKIP supporters’ personality cult around Farage. He wasn’t wrong. The USSR never started a world war or genocide. In fact the USA was and is much more dangerous! Link “do browse our collection of 1984-related resources” is broken. Ben shapiro and orwell would be good friends.